The world faced a major food crisis in the mid-1960s, when India and most of Asia had suffered back-to-back droughts and were dependant on food aid. The US President's Science Advisory Committee remarked in a 1967 report that it would take an "innovative effort unprecedented in human history" to "master" the crisis. Thousands of kilometres away in Mexico, the high-yield varieties of wheat developed by scientist Norman Borlaug and his team of researchers provided the answer. Borlaug, who recently passed away, subsequently won the Nobel Peace Prize for saving a billion people from starvation. 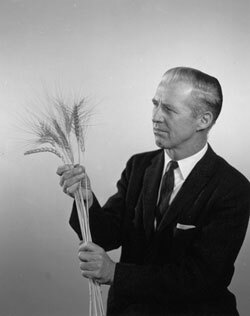 "Borlaug's seeds grew faster and were insensitive to daylight length, enabling more crops to be grown each year on the same piece of land," wrote Peter Hazell, a prominent agricultural economist, in "Think Again: Green Revolution", an article in Foreign Policy, a bimonthly American magazine owned by the Washington Post Company. Simultaneously the Philippines-based International Rice Research Institute (IRRI) had developed high-yielding rice varieties, which spread all over Asia, doubling annual cereal production in the region from 310 million metric tons to 650 million metric tons between 1970 and 1995. Asia's population grew by 60 percent in the same period but the rise in food production "was so great that cereal and calorie availability per person actually increased nearly 30 percent, and wheat and rice became cheaper," wrote Hazell. William Gaud, then Administrator of the US Agency for International Development (USAID), dubbed this phenomenal growth in food production the "Green Revolution". Hazell commented in a briefing paper for the International Food Policy Research Institute (IFPRI), which promotes sustainable solutions for ending hunger and poverty, that Gaud was "hoping it would help contain the Communist 'Red Revolution' that was capitalizing on poverty in developing countries at the time". It is time for another green revolution: we need to produce 70 percent more food for an additional 2.3 billion people by 2050, mostly in developing countries, according to UN projections. Sub-Saharan Africa's population is expected to grow the fastest, adding 910 million people, or 108 percent; East and Southeast Asia's the slowest, adding only 228 million, or 11 percent. In November a global summit convened by the UN Food and Agriculture Organization (FAO) in Rome will discuss "How to Feed the World by 2050". The Green Revolution failed in Africa, but with a few changes it could work, said David Dawe, a senior agricultural economist at FAO. The revolution in Asia rode on the success of irrigated wheat and rice, which play "much smaller roles" in Africa; the continent needed improvements in its staple crops - maize, sorghum, millet and cassava - grown in rain-fed conditions. But even when new improved varieties did arrive, the longed-for green revolution was not sustainable. Weak rural infrastructure in African countries meant high transportation and marketing costs for farmers; the inability to import expensive fertilizers, which had played a big role in boosting food production in Asia, proved to be the undoing of most efforts in Africa. Specialized maize cultivation on fragile land brought soil degradation; corrupt marketing boards undermined the revolution and led to its eventual collapse, wrote Thom Jayne, who teaches agricultural economics at Michigan State University in the US, in a paper he co-authored. "The net result is that it is simply not profitable for most African farmers," who are small-scale, dependent on rainwater, and have to make do with little policy support from governments "to shift to high-input, high-output farming systems," Hazell commented. Achim Dobermann, Deputy Director General for Research at IRRI, told IRIN that the basic ingredients for a green revolution in Africa would have to be similar to those in Asia: high-yielding rice varieties adapted to African rice ecosystems, development of a seed sector to make these varieties available, and improvement in the supply of inputs, infrastructure and irrigation. African governments would also have to take a leading role. "On average, Asian countries were allocating over 15 percent of their total government spending to agriculture by 1972, and they doubled the real value of their agricultural expenditure by 1985," wrote Hazell. Critics of the Green Revolution have often highlighted its indiscriminate and excessive use of chemical fertilizers and pesticides, which polluted waterways and affected wildlife. "These were unintended consequences", Jayne told IRIN. "And it would behoove us to consider ... how many people would have starved or remained malnourished and impoverished if the green revolution technologies hadn't been promoted? We're at a point now where clear-headed policies toward both agricultural and environmental technologies are needed to sustain the planet and its inhabitants." Christopher Barrett, a leading food aid expert who teaches development economics at Cornell University in the US, said a more environmentally friendly green revolution was "feasible and necessary". It should rely more heavily on integrated soil-fertility management which blended organic and inorganic nutrient supplements; on rainwater capture and conservation more than pumped groundwater; on mixed cropping systems to ensure adequate dietary diversity, and resistance to pests and diseases that could wipe out monocultures; and on crop varieties and animal breeds adapted to Africa's highly varied agro-ecosystems. According to Hazell, many experts agreed that Africa could potentially increase food production by as much as 100 million metric tons or more per year.